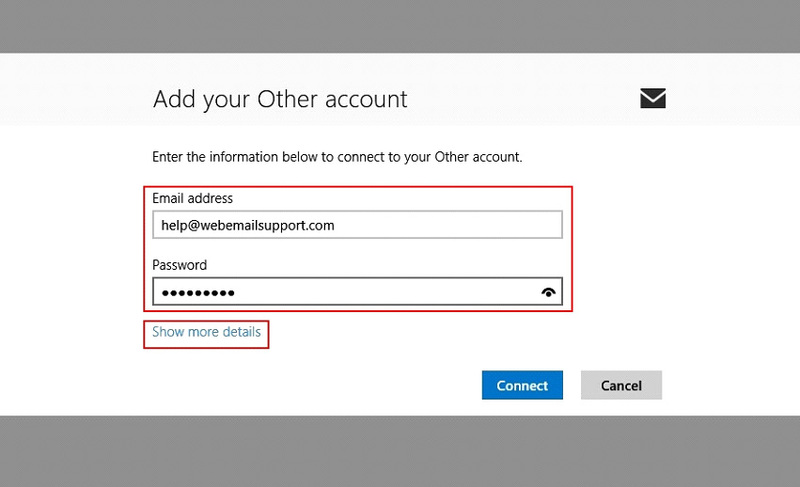 Note: In order to use Windows 8 Email, you must be logged into a Microsoft account. This is usually set up during the installation and configuration of Windows 8. This article assumes you have already created a Microsoft account for your Windows 8 software. If you have not done so already, access the settings within Windows 8 to create and/or log in to your Microsoft account. 1. 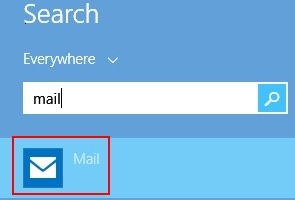 Click the Mail icon to open the Mail program. If you do not see the icon, you can search for the icon. 2. 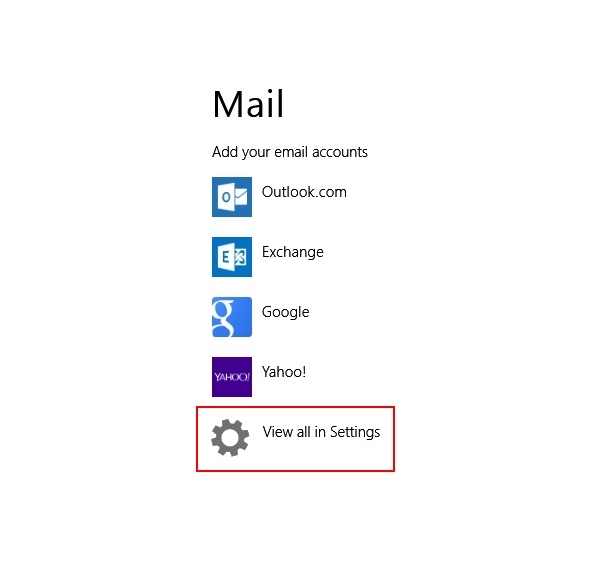 If this is the first time setting up mail, click View all in Settings as shown in the following images. 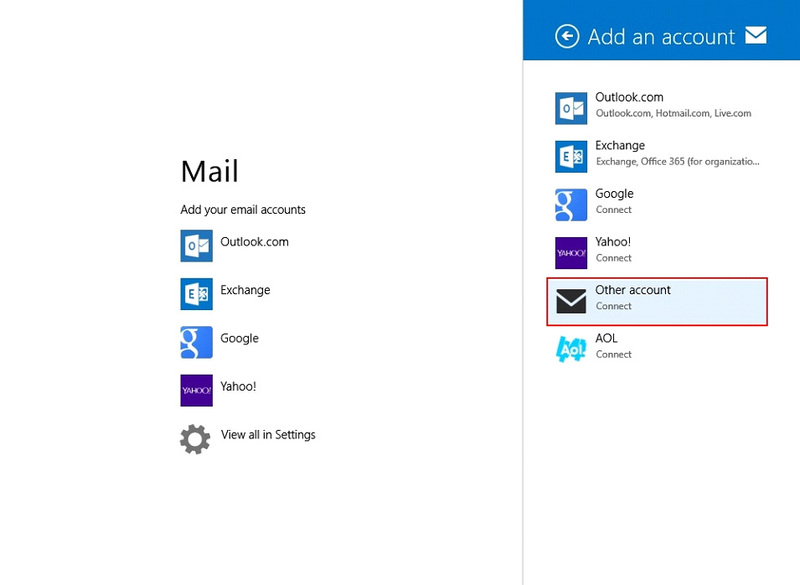 If you previously set up an account, when you launch Mail you will land into the mailbox view. Move your mouse to the far right of the screen or swipe left to bring up the right menu. Click or tap Settings > Accounts > Add an account. 3. From the Add an account window, click Other account. 4. Select IMAP and click Connect. 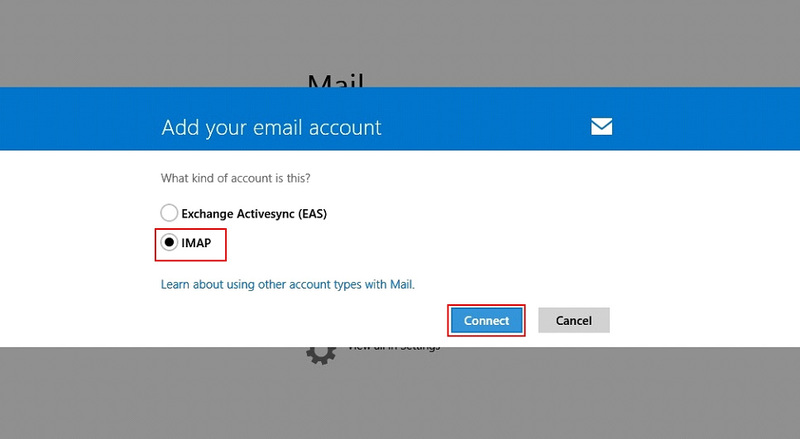 Note: Windows 8 Mail is only compatible with IMAP and does not support POP3. 5. Enter the Email address and Password of the account that you are currently configuring. Then click Show more details to continue. 6. Reference the following table to enter the required settings. Then click Connect to complete your setup. Email address Enter the full email address of the email box that you are currently setting up.